Our church began in 1957 when a group of people felt the need for a new Christian Reformed Church in the rapidly expanding southern area of Holland. They met in July of 1957 and the response was so good they applied for permission to become a church from the denomination. Enthusiastic support was given and the seed began to grow. Worship began in September, 1957, in the all-purpose room of Southside Christian School. Soon, that proved too small for the growing number of worshipers. Plans were discussed to purchase the present 3-acre site on Central Avenue and 37th Street, and build a church there. After meeting in the Maplewood Christian School gymnasium for three years, the time had arrived for the church structure to be built. There were now 69 families. The building committee presented the unique design for the Sanctuary. The building was dedicated on September 9, 1962. The congregation continued to grow and several pastors have served us well: Revs. Edward Cooke, Gerald Postma, Kermit Rietema, Larry Slings, Dan Ackerman, and John DeVries. Our current pastor, Matthew J. Stob (Pastor Matt), came to Maranatha in November of 2009. Maranatha was inspired by Rev. Rietema to become a mission-oriented church. Several Vietnamese and Cambodian families were sponsored and helped. Rev. Rietema’s influence can still be felt with the support of several missionaries and ministries, both locally and abroad. By 1993 there were 130 families, and a large addition was built consisting of a gymnasium, offices, restrooms, and nurseries. This was done with an incredible show of volunteer labor and goods. When people hear “Maranatha,” one thing that immediately comes to mind is the physical shape of the building. It’s pretty unique. Here’s a brief explanation as to why the building looks the way it does: Since the name Maranatha means "Lord, come quickly," the large clear windows were designed to sweep upwards. This signifies the congregation's looking forward to the return of our Lord Jesus. 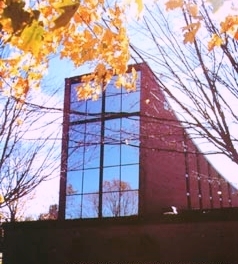 On September 9, 1962, the building was dedicated.